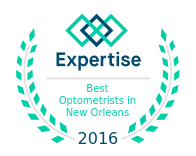 With an office in Metaire, Precision Family Eye Care serves Louisiana’s New Orleans area. We are located in the same medical building as East Jefferson Family Practice, near Chik Fil -A. Additionally, there are two parking areas in the rear of the building. We are on the second floor and there is an elevator available for use. Call us to make an appointment with our eye doctor to discuss your eye health concerns and prescriptions for eyeglasses, and/or contact lenses.